Ronja name of the girl was born in thunderstorm raged over the mountain. Her father Matt was the leader of band robber that live in that mountain. 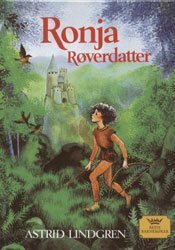 Ronja love to play alone in the forest that she fells truly like home, till one day he meet Birk the son of Matt's enemy, together Ronja and Birk go through their own adventure away from their father hostility. I read this book when i was in college, i love children's literature when i was in elementary till now. there was something we still loved that we can not leave about our chilhood, like our imagine, fantasy about our own adventure.